Distinctive for its twin soaring towers, vaulted ceilings, intricate carvings, and large footprint, the Cathedral of St. Peter and Paul rivals the grandeur of the historic cathedrals of Europe. Though hidden within Cathedral Square, a failed urban renewal project led by renowned architect I.M. Pei, the Cathedral is not as known as it should be. No street directly leads to the building, and the plaza on which it sits is falling apart under a canopy of trees surrounded by city-owned properties. While daily mass still attracts a substantial congregation, the small shops and thoroughfare that once made the Square a vibrant center of downtown life are a fading memory of the Cathedral’s past. 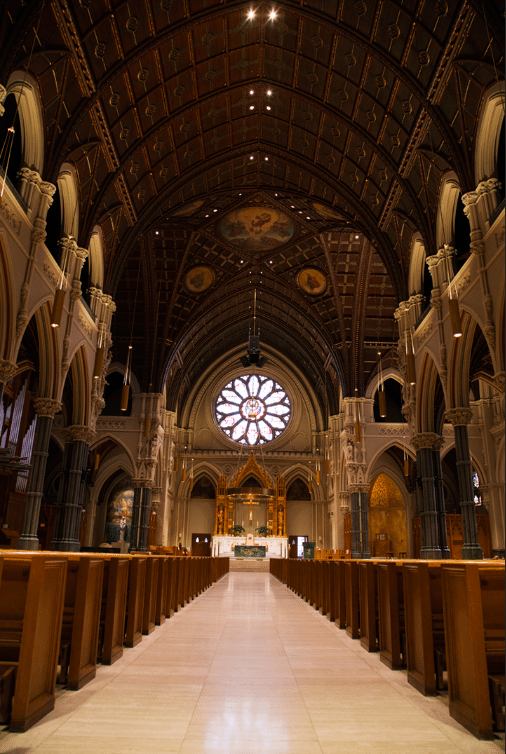 Experience the soaring ceilings and intricate carvings of Rhode Island’s grandest church. Organist Philip Faraone will be onsite to play the magnificent pipe organ at intervals throughout the day. In depth tours of the Cathedral and its history will be offered at 11am and 2pm.